Mike Nevin reflects on Liverpool's 4-1 win over Cardiff City as The Reds go top of the league. What a strange afternoon. It seems churlish to come away from Anfield a mite uninspired after Liverpool racked up four goals for the second time in four days. It feels unfair to be overly critical of a somewhat laboured performance when victory means the Reds stand three points clear after ten matches, still unbeaten and very much on course to deliver what we’ve craved for decades. Perhaps the biting Arctic wind that chilled the prematurely wintry air stripped away some of our post-match glee or maybe it was just that such passive opponents as Neil Warnock’s Cardiff were able to escape a more searching examination. The Reds won comfortably without showing any real intent until the closing stages when a couple of late goals massaged the scoreline and added a sheen to the afternoon that was absent for much of the day. Prior to kick-off there is a collection organised by Spirit of Shankly for the stricken Irish Liverpool fan, Sean Cox, victim of a mindless attack by AS Roma fans back in May. The club has agreed to match the total fees donated by supporters for his rehabilitation and buckets at the turnstiles are bulging in an act of generosity that comes naturally for fans of this club. Spirit of Shankly, instrumental in chasing Tom Hicks and George Gillett out of town during some of the club’s darkest days, remain critical to fan representation and this is just the latest initiative showing that supporter groups can remind football clubs of their responsibilities. As a seasoned watcher it is genuinely difficult to get pumped up for matches against the likes of Cardiff and although the players claim to treat each game with the same importance, sometimes complacency in the stands mirrors a laissez-faire attitude on the pitch. Even Jurgen Klopp reveals that he’s none too concerned about any threat posed by the opposition by giving mad-cap Alberto Moreno an unexpected outing at left-back. The Kop is quiet to begin with but the Cardiff taunts about Anfield’s low-key atmosphere are soon rammed down their throats. When will these away fans realise that when you’ve seen slayings of Europe’s greatest names, players of the highest repute have their minds scrambled by our crowd, that screaming our heads off at luminaries such as Junior Hoilett and Sol Manga is just unseemly behaviour. The Reds are in front early, courtesy of Mohammed Salah following up after a scramble that leaves three Cardiff defenders prone in the box at an Anfield Road End illuminated by the mid-afternoon sun. We sit back in anticipation of an exhibition that doesn’t materialise during a turgid first half. 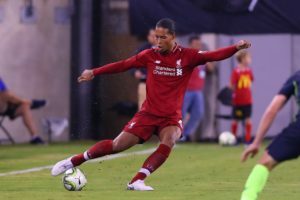 Liverpool are so dominant that Virgil Van Dijk, looking every inch a future skipper, spends much of his time ambling forward unconcerned that his presence is required at the back. The remaining highlight of a half which sees Liverpool play at a pace more in tune with a testimonial is a Roberto Firmino no-look, backheel nutmeg on his own goal line which draws roars of laughter from the Kop. With the visitors intent on nothing but holding firm, this is just too easy and the Reds are lulled into a torpor as the game meanders past the hour mark. As if to cast off his own frustration, Sadio Mane larrups an angry blast across Neil Etheridge in the Cardiff goal and celebrates with a jaunty little jig in front of fans happy to rise from their seats to shake off their own lethargy. Once again the goal is something of a false start as Cardiff quickly pull a goal back and instill a bout of the heebie jeebies among an increasingly agitated crowd. Van Dijk’s inadvertent deflection of a cross allows Callum Paterson to stab home through the legs of a redundant Alisson Becker charged with his first task of the day. The sense of shock is palpable if only for the rarity of an away team goal – the first in front of us since February. Thankfully, Liverpool are affronted by Cardiff’s cheek and suddenly click into gear to soothe the nerves. Xherdan Shaqiri’s exquisite drop of the shoulder and slide-rule pass into the net for his first goal in a red shirt is in keeping with his recent contributions and when Mane sprints a full seventy yards to dink home from Salah’s weighted ball there are warming reminders of last season’s blistering counter attacks. The inspiration is in the final 4-1 scoreline. These were easy pickings with Klopp’s men in second gear throughout. A stiffer task awaits at the Emirates next week but Liverpool are well-placed to go into overdrive.